THE SIKH NUGGET: Sikhs and the British: The Charter Act and the beginnings of the missionary movement. Sikhs and the British: The Charter Act and the beginnings of the missionary movement. Sikh Historian and Content Editor of www.sikhnugget.com Gurinder Singh Mann, discusses the relatively unknown Charter Act which introduced the Christian missionary movement into India. In my recent TV interview regarding the British and the Sikhs, I referred to the British Act of Parliament called the Charter Act of 1813. This relatively unknown piece of legislation gave the green light for Christian Missionaries to start their preaching in India. Whilst the British had been in India for many years under the guise of the East India Company, their work was restricted. Interestingly the East India Company did not want missionaries interfering in their politics of Trade and Commerce and thus thwarted any attempts for Christian Ministers to bring religion to the masses. There were several individuals who wanted to push through the reform allowing the ‘Gospel’ to be introduced in India. This included William Wilberforce (1759-1833) who was famous for helping to bring an end to the slave trade but paradoxically wanted a change in India so that Christian values could supersede those of the common man. He tried to change the Charter Act in 1793 and failed. In 1813 he created a mass movement to lobby Parliament by getting over 900 petitions sent to Parliament regarding the introduction of Missionary Centres in India. On 22nd June William Wilberforce gave a resolute speech lasting three hours which influenced the decision to change the Charter Act. This Act was an extension and renewal of the earlier Acts of 1772, 1784, 1793, which previously gave the East India Company a monopoly regarding terms of trade in India. The 1813 Act was different in several ways and was essentially a way to end the monopoly of the East India Company. What was to come would change India but would also significantly impact on Punjab and the religion of the Sikhs in a most profound way. At the time of implementation the Punjab was not under British rule. Maharaja Ranjit Singh (1780-1839) was keeping the British at bay by signing the Treaty of Amritsar in 1809, but the incremental changes brought in would have a devastating effect on the Punjab. 1. The Act affirmed that the Crown was sovereign over British India. This included the East India Company coming under the direct control of the Crown. 2. The promotion of education in India. The translation of texts into native languages and vice versa. 3. Christian missionaries allowed to proselytise their religion. They set up missionary centres known as missions. The British used the above changes in their operations to increase the number of people coming over to India and eventually implement changes to the fabric of society. However the translations of the Bible into various languages and dialects had begun some years previously. 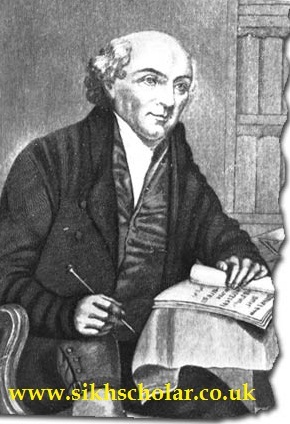 William Carey (1761-1834) in 1792 had published ‘An Enquiry into the Obligations of Christians, to use means for the Conversion of the Heathens.’ In 1793 he was in India and after several years fighting the East India Company set up his mission and the translations of the Bible began. The Punjabi Bible, nearly complete, issued first in 1815, had become so popular by 1820 as to lead Carey to report of the Sikhs that no one of the nations of India had discovered a stronger desire for the Scriptures than this hardy race [Sikhs]. At Amritsar and Lahore "the book of Jesus is spoken of, is read, and has caused a considerable stir in the minds of the people." A Thug, asked how he could have committed so many murders, pointed to it and said, “If I had had this book I could not have done it." The seeds of destruction for the Sikhs had been sown. Gurinder Singh Mann is author and Sikh Historian. His project with the PCA showcased the first English translations of the Sikhs. He is working on a book looking at the British and the Sikhs. Visit www.sikhscholar.co.uk for his other work.